COOL THINGS ARE BEGINNING TO LIGHT UP THE FUTURE for one artist in Northeast Portland. Jeff Meyers, a self-employed artist and graphic designer, has been putting his artistic touch on ornate neon signs for three years, growing the brand name of Modern Artifacts. Beginning in 2012 as Route 66 Relics, Meyers attended car shows displaying and selling his original pieces. A year and a half later Meyers changed the name to Modern Artifacts to truly embody and describe his work as original with a fresh antique twist. The name change provided Meyers with a larger audience, expanding the arena from strictly automotive to include motorcycle, Tiki-Style collectors, business owners, museums and hotels. Each of Meyers’ pieces are unique and designed by Meyers specifically for the customer. “They are authentic to the period and lightweight, making anything possible,” Meyers said. With the incorporation of electronics and controllers to dim and flicker the neon lights as well as moving motorized elements and sound effects, Meyers can make any sign appeal to the customer base. “Hearing the customer’s vision and creating a personal piece that they will love for a lifetime is the most rewarding part of the production process,” Meyers said. After spending anywhere from eight hours to several months on a commission, Meyers presents each piece to the customer with certainty of customer satisfaction. Though Modern Artifacts is growing and has moved from a basement to a workspace/showroom, Meyers will not be hiring more hands to produce designs. Keeping the business personal provides for a more intimate and original process for each piece. “I want every piece to have my artistic stamp on it,” Meyers said. Some of Meyers’ commissions include Ignito, a seven-foot interactive robot for the World of Speed Museum in Wilsonville, Oregon and a 14ft rolling wall rocket car called “Spirit of America as well as a personalized vintage Industrial Finishes sign that is proudly displayed in the Eugene storefront. To view Modern Artifacts and Jeff Meyers’ unique pieces as well as apparel and accessories, visit modern-artifacts.com or email jeff@modern-artifacts.com. This past March, members of Industrial Finishes were walking through the Portland Roadster Show and met Jeff. His display of “modern artifacts” was truly impressive and showcased his tremendous work. From there, an idea was born. 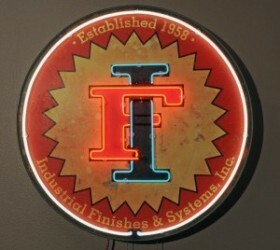 Industrial Finishes approached Jeff about creating a neon sign featuring the company’s original logo from 1958. “It took some digging to find something that accurately reflected that logo, but we finally found an old envelope that included the logo we needed. From there, Jeff took over,” Duncan added. The result is an amazing reproduction of a vintage sign featuring the near-60 year old logo. The sign was presented to company founder, Stuart Barr, as well as the rest of the Barr family. 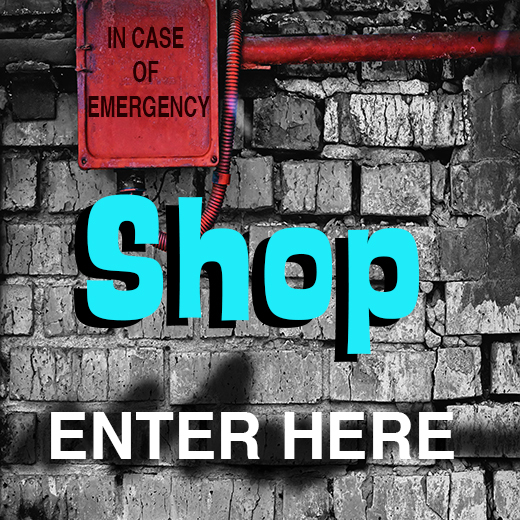 The sign will reside at Industrial Finishes’ Eugene, Oregon store.